As a boy, Brahmananda preferred meditation and singing devotional songs to doing school work or playing with friends. As he grew so did his focus and he spent more and more time in silence. Trying to interest him in the world his family arranged a marriage, but this only led him to his teacher, Ramakrishna, to whom the bride’s family were devoted. 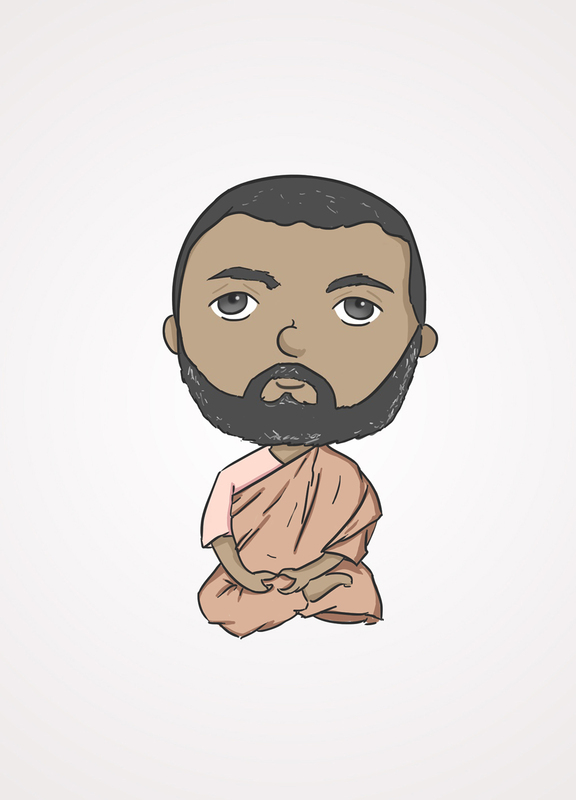 Brahmananda studied with his teacher until Ramakrishna died, then entered a period of solitude to attain his own “fullness of God.” Having achieved this goal, he returned to work with the Ramakrishna Order he founded with other disciples. Throughout his life, Brahmananda was focused on his goal and directed immense discipline toward it. This intense discipline did not become discourtesy toward others or neglect for his responsibilities as President of the Order. To the contrary, people described him as having immense gentleness because he ensured that every effort and interaction was guided from his spiritual core. Under his guidance the Ramakrishna Order grew immensely by establishing religious schools, monasteries, charities, and emergency relief assistance in India, then across the world. Though often described as a saint, Brahmananda didn’t spend time floating around on clouds. His immense spiritual attainment didn’t translate to him being “above” the world around him. This is applicable for people who get up and go to work each day, regardless of whether they wear a monk’s robe or a business suit. By acting with focus and discipline, then bringing that to every interaction and task, we bring his example to life. Doing this to achieve our own goals, without setting ourselves above others, can allow us to share the gentle humility of his example.